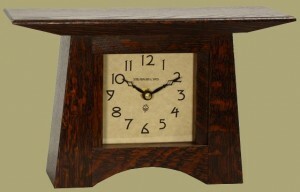 Handmade by our friends at Schlabaugh & Sons in Iowa, this heirloom-quality Craftsman style mantle clock is crafted from quartersawn white oak and finished in a rich, deep stain that matches our own Signature Finish. Accented with a fine parchment face under a glass lense. 10"w x 5.5"h x 4"d.